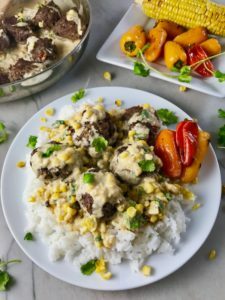 Chipotle Meatballs with Mexican Corn Cream Sauce are unexpected and delicious! The meatballs are made with lean ground beef, black beans, chipotle peppers in adobo sauce, ground tortilla chips, and scallion. They are then baked, which makes cooking super easy and healthier than frying. 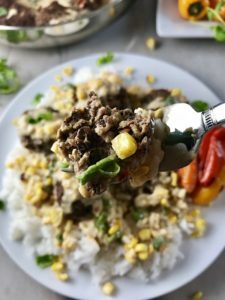 The creamy sauce is inspired by Mexican Street Corn. 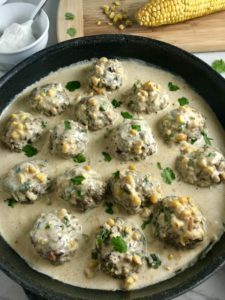 The slight sweetness from the corn, the smokiness from the Mexican spices, the subtle heat from the Chipotle adobo sauce, and the cool and tangy sour cream make this creamy sauce the perfect complement to the Chipotle Meatballs! We love Mexican food in our house! If they could, my daughters would have Taco Tuesday everyday. So when I was thinking of a new way to reinvent meatballs, I was inspired by my and my girls’ love for Tacos and Mexican food! 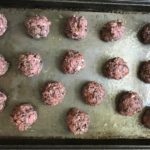 The meatballs are a wonderful combination of black beans and lean grass-fed ground beef. 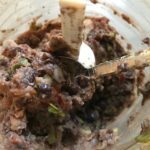 The black beans are blended so that they are partly creamy, but still have bits of bean for texture. 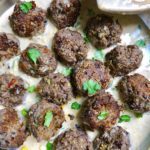 The creaminess from the beans added to the ground beef makes these meatballs so MOIST, tender, and so flavorful. 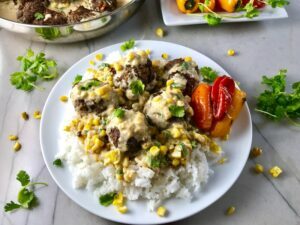 The Chipotle Peppers in Adobo Sauce give the meatballs that Mexican flare! 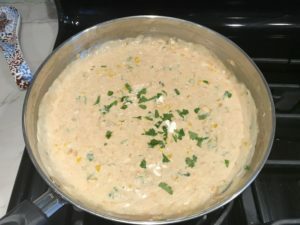 Then there is the Mexican Corn Sauce! 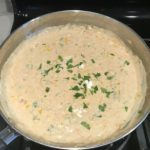 I don’t know why I didn’t think of this earlier in my life…a fusion of Cream Corn + Mexican Street Corn + sour cream sauce….HEAVEN!!! 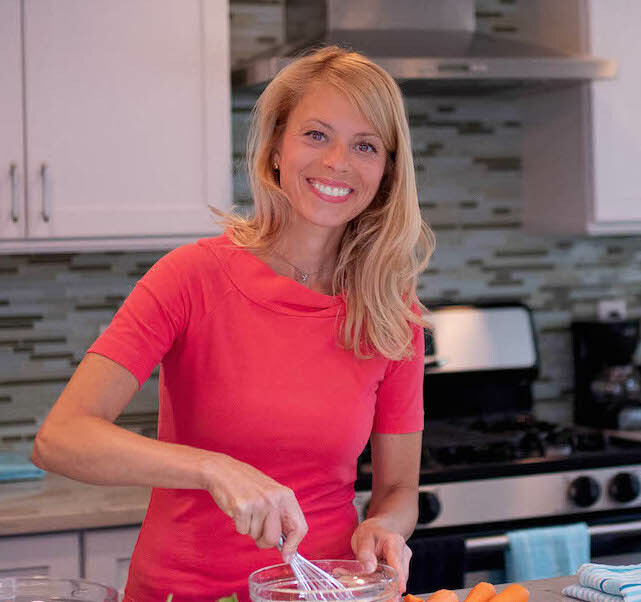 Looking for more easy dinner recipes? 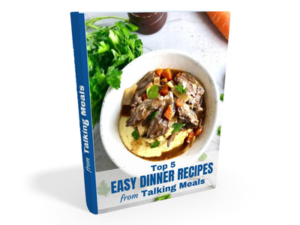 Sign up now to get your FREE e-cookbook with the TOP 5 EASY DINNER RECIPES from Talking Meals! 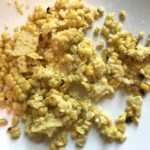 This recipe uses Gluten-Free Tortilla Chips instead of breadcrumbs as the binder for the meatballs. 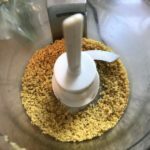 Add a handful of tortilla chips to a food processor and blend until fully ground and you get 3/4 cup. Remove from the processor and set aside. 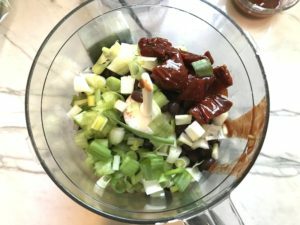 To the same food processor (no need to clean), add the drained beans and sliced scallions. Put 1 tablespoon of the scallion greens in a baggie for the sauce and the rest go into the food processor for the meatballs. Rough chop 2 Chipotle Peppers and add to the food processor with 1 tsp of the sauce. Also to the food processor add 1 tbsp water, 1 tsp salt, 1 tsp ground pepper, 1 tsp ground cumin. Pulse the food processor until the mixture is completely combined and you can see that the chipotle peppers have been fully blended into the beans. You should see mostly creamy beans, but still some bean bits left for texture. To a large mixing bowl, add the ground beef, the bean mixture, 1 egg, and 1/2 cup of the tortilla crumbs. 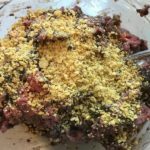 Mix with hands or a large fork to completely combine. 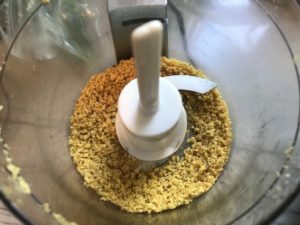 Add more tortillas crumbs as needed until the mixture easily forms into balls. Cover bowl and store in fridge until ready to make meatballs and bake them. You could also bake these in advance and reheat them later. Roast the corn by placing it under the oven broiler for 5 minutes on each side. Watch carefully to make sure it doesn’t completely burn. When it is done, cut off the kernels and store in a storage bag. Mince 1 clove garlic and add to the same bag with the corn. Place the Meatball mixture, the corn, and the cooked rice all on a pan in the fridge for cooking later. While the meatballs are cooking, make the sauce. Add 1 tsp Extra Virgin Olive Oil to a preheated pan and then add the roasted corn kernels, minced garlic, and 1 tbls scallion greens. Stir and saute for 3 minutes and then add 1 tsp of the sauce from the Chipotle peppers in Adobo Sauce. You can add more if you want it spicier. Stir in the chicken broth, cumin, chili powder. Bring the sauce up to a simmer and cook for 5 minutes, then turn down heat to keep warm. When the meatballs are done, remove from the oven and let sit for a few minutes. At this point, to the sauce whisk in the sour cream, add the cilantro. Last, add the meatballs to the sauce. Make sure to add any brown bits from the pan to the sauce too! Pour the meatballs and sauce over the rice, garnish with cilantro and add the sweet peppers. Enjoy!! 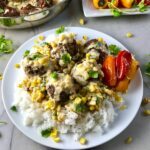 Chipotle Meatballs with Mexican Corn Cream Sauce are delicious! 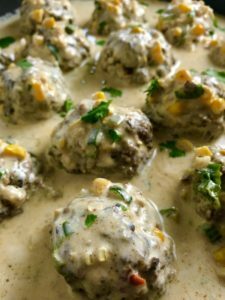 The meatballs are made with lean ground beef, black beans, chipotle peppers in adobo sauce, ground tortilla chips, and scallion and then baked to perfection. The creamy sauce is inspired by Mexican Street Corn with sweet corn, smoky Mexican spices, cool and tangy sour cream. Yum! Add a handful of tortilla chips to a food processor and blend until fully ground and you get 3/4 cup. Remove from the processor and set aside to be added to the meat later. You should only need 1/2 cup for the meatballs, but you will want extra just in case your meat mixture is too wet. 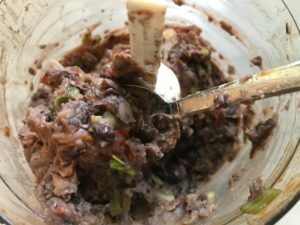 Drain and rinse the black beans and put into the same food processor. Slice the 4 scallions. 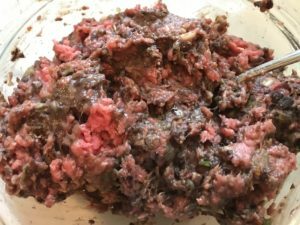 You will need to save 1 heaping tablespoon of the greens in a baggie for the sauce, the rest will go into the food processor for the meatballs. Rough chop 2 Chipotle Peppers and add to the food processor with 1 tsp of the sauce. Save the rest in a storage container as you will need the sauce for adding to the Cream Sauce later. Also to the food processor add 1 tbls water, 1 tsp salt, 1 tsp ground pepper, 1 tsp ground cumin. Pulse the food processor until the mixture is completely combined and you can see that the chipotle peppers have been fully blended into the beans. You should see mostly creamy beans, but still some bean bits left for texture. To a large mixing bowl, add the ground beef, the bean mixture, 1 egg, and 1/2 cup of the tortilla crumbs. 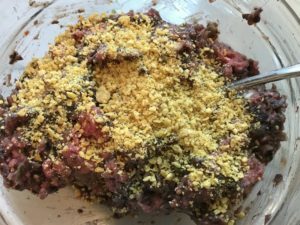 Mix with hands or a large fork to completely combine. If the mixture seems too wet, sprinkle in a little more tortilla crumbs. Cover bowl to seal and store in fridge until ready to make meatballs and bake them. Note: You could bake these off in advance and reheat them later. 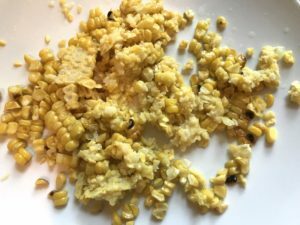 Roast the corn by placing it under the oven broiler for 5 minutes on each side. Watch carefully to make sure it doesn't completely burn. When it is done, cut off the kernels and store in a storage bag. Mince 1 clove garlic and add to the same bag with the corn. 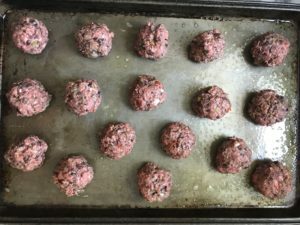 Roll the meatballs into 1.25 inch diameter balls and place on large baking sheet that you have lightly coated with Olive Oil. Add the whole mini sweet peppers in and around the meatballs (note, this is optional). Bake in oven on center rack for 30 minutes. Plate: Pour the meatballs and sauce over the rice, garnish with cilantro and add the sweet peppers. Enjoy! !